Team Third Law’s competitors ended their 2015 season with a final tournament in Lakeland, where they fought 42 matches and brought home 26 medals and one championship belt. It was a great day for the Naples, Florida Brazilian Jiu Jitsu school, with a total medal count of 15 gold, 6 silver and 6 bronze. The kids martial arts competitors included Eli, Renzo, Corey, Tony, Robert, Pedro, Dominic, Devon, Tyler, Nicholas and Andy. As always, the kids trained the Friday before in their usual Masters Class at Team Third Law Brazilian Jiu Jitsu and Muay Thai Kickboxing. Then they piled into a 15 passenger van for the road trip. Also, as always, there was some craziness along the way, thanks mostly to Master Roberto. A good night’s sleep at a hotel in Lakeland and the Naples BJJ travel team members were up and ready to go in the morning for the tournament, put on by the North American Grappling Association (NAGA). Eli was up first this time, and he won two matches in his no gi beginner division for gold. The first he won by submission in the sweetheart position and the second by points. In the gi, he won his first match by americana for silver. Renzo, who at 6 years old is the team’s youngest competitor, won two matches for gold in his gi beginner division. In no gi beginner he got silver. Corey won his first gi match 16-0 and won another gi match by points, for bronze in his gi beginner division. He also got bronze in his no gi beginner division. Tony, who was going to fight beginner but was moved up to intermediate, won one match in no gi by points for gold. In the gi, he won one match by points and then closed the division out with his teammate Robert, taking the silver medal. Robert won two matches in his no gi intermediate division by points for gold. In his gi division he won his first match by kimura and closed the division with his teammate Tony, taking the gold medal. Pedro won his first no gi intermediate match 3-0 and got silver in that division. He also won one match by points in his gi intermediate division for silver. Dominic also earned two silvers in his gi and no gi intermediate divisions. He won one match points in both divisions. Devon won one match in his gi intermediate division by americana and closed it out with his teammate Tyler, taking the gold. He also got bronze in his no gi intermediate division. Tyler won two matches in his no gi intermediate division by points, taking gold. In gi he won one match by points and closed out the division with his teammate Devon, taking silver. Nicholas did two no gi intermediate divisions, winning gold in both. He won one match by triangle and the other by points. He also won gold in his gi intermediate division, winning one match by submission from sweetheart pressure. Andy, who is 14 years old, fought both in the teens and adults divisions. He has been training at the Naples BJJ school for less than two years and is already dominating his teens divisions and winning matches in the adults blue belt and intermediate divisions. In teens gi at this tournament, he won two matches by points in a mixed blue and green belt expert division to take home the championship belt. In teens no gi expert he won one match by triangle for bronze. In the adult intermediate division, Andy won one match 9-0 for gold. In the adult blue belt division he won two matches for gold, outscoring his first opponent 4-0 before the other fighter was disqualified and winning the second match on advantages. Also fighting in the adults division, Eli’s dad David made his competition debut. He won one match 2-0 in both his white belt gi and novice no gi divisions for gold in both. After the competition, the Naples BJJ travel team members piled back into the van and headed to the Lakeland Family Fun Center to continue the party. They played Laser Tag and did a Laser Maze called Vault Assault. Rihanna, Eli’s little sister, was the champion of the Laser Maze, with Andy coming in second place. All in all, it was a great end to the 2015 competition year. 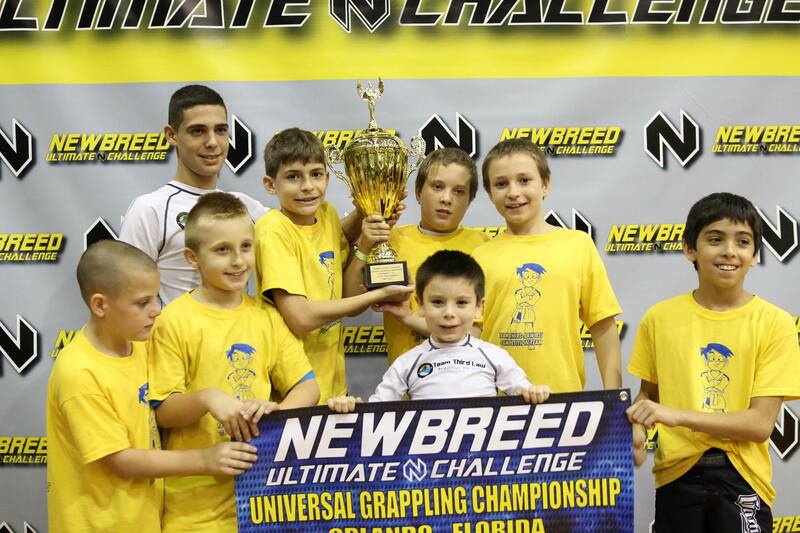 Next up the Naples Martial Arts kids competition team will take on Newbreed in Coral Springs on January 23, the first competition of 2016!